This sounds nice and simple, and looks pretty self explanatory when you look at the nice clear diagram in the manual. 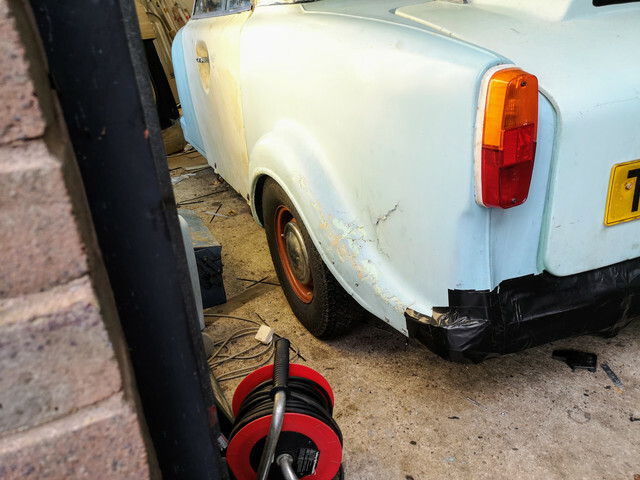 Task number one for today was to get the offside brake light working again as I noticed yesterday when I got back into the garage that it was out again. This eventually turned into a 45 minute round of chasing my own tail before re-terminating the main ground for the cluster as I should have done in the first place - which of course immediately resolved the issue and also got both sets of indicators to flash at the same rate for the first time. 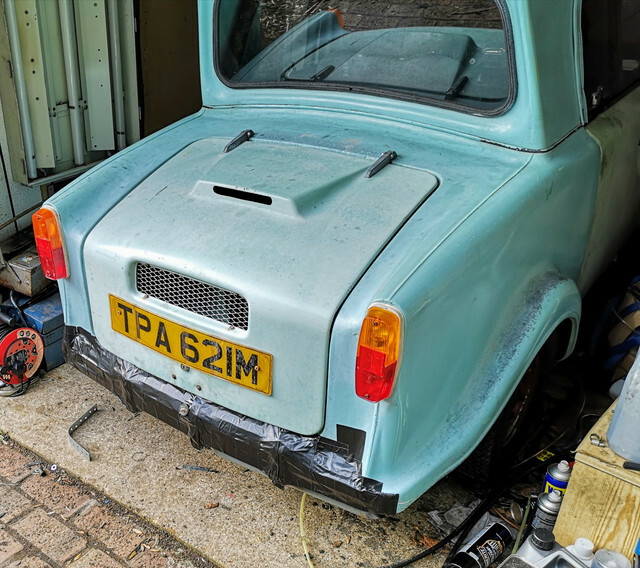 Task number two was to cover up some of the bare metalwork on the rear of the car. This has wound up with the whole thing encased in duct tape for now, looks horrific, but at least there are now no sharp edges accessible. I'm sure a bunch of these cars were largely held together by gaffer tape back in the day too. No, I'm not proud of it. 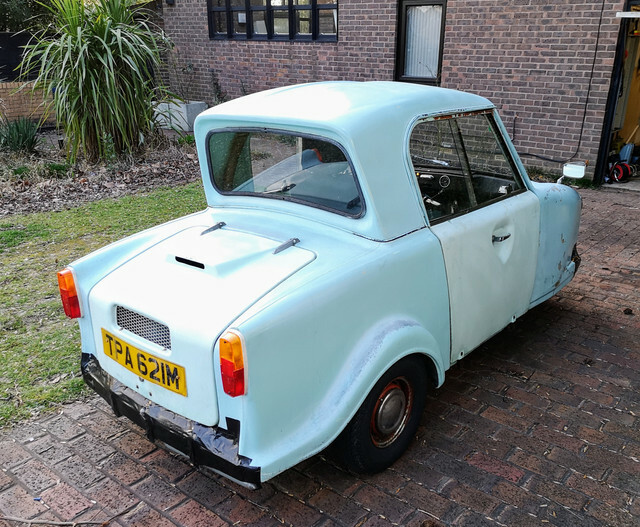 It's a means to an end - I want to drive the thing, and don't want to wait until I can put aside a couple of complete afternoons with decent weather to attack it with fibreglass. The offside front corner has had a steel band added to reinforce it, and has been similarly plastered in tape. I've also stuck a patch on the hole in the roof primarily to assist in keeping the weather out. Speaking of keeping things in or out, I'm glad to see that the lock on the front service cover has freed up after a couple of months of regularly dosing it with penetrating fluid. Nice the way stuff seems to keep coming back to life. With this all done it was time to go for today's test run. After a little noodling around our estate again I decided that it was time to try the higher speed run. No horrors to report. Managed to get up to just under 50mph before having to brake for the roundabout at the bottom of the hill. On the way back progress was slowed a bit, but still got up to 40 or thereabouts. 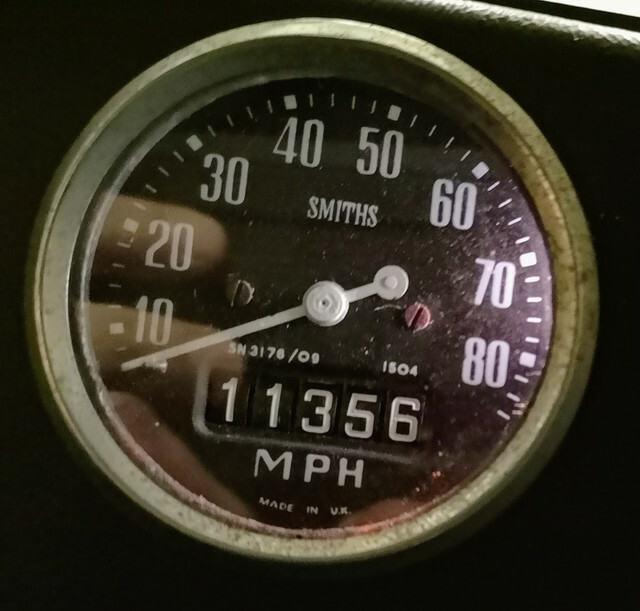 The only slightly unnerving aspect was that she briefly decided not to give me any power when I intitally went to pull onto the roundabout coming back - a fraction of a second's delay and audible pop back through the carb and she was off again. I've notice this happen a few times on roughly half throttle. Guessing there's still a bit of crud floating around in the carb. On arriving back from that run (wanting to give thigns a check over given it was the first time she had exceeded 30mph in quite a while), there was quite an odd "hot" smell - which I reckon was coming from the paint on the silencer after a bit of checking. The popping back through the carb I reckon is the reason that the carb itself was damp with fuel. The carb being cold I think was the only reason this hadn't evaporated pretty much as soon as it had ended up there. I'll keep an eye on this. I then went about a little further local testing, getting a little more used to the controls meant that a certain degree of mild hooning may have taken place. 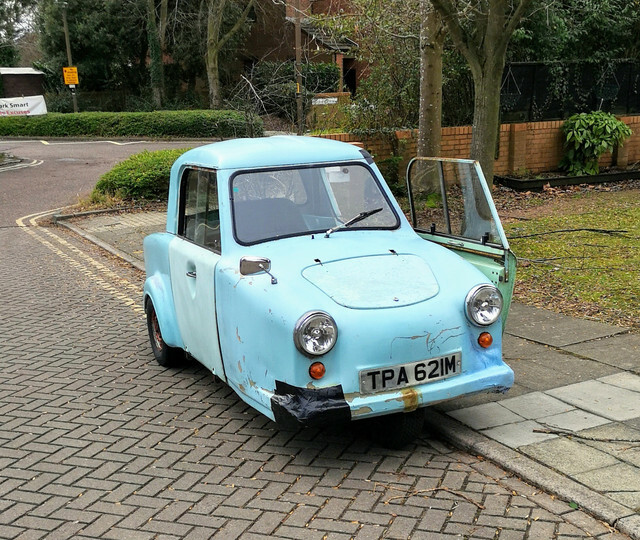 It's a long while since I was last in a Reliant, but to my mind this definitely feels less tippy when you throw it into a corner or roundabout. I did attempt to get some video footage of the test drives - but managed an epic fail today on a video front. Attempt number one went just fine until the first roundabout was taken at any speed...at which point the phone fell out of where I'd wedged it. Attempt number two would have been fine if the phone hadn't wound up pointed mostly at the ceiling. I'm going to try to dig out the Not-A-Go-Pro tomorrow and use that instead as it at least has some proper options to secure it to the car. If you guys want me to upload the video I do have just let me know...You can kind of see what's going on and have the audio to go with it. Oil leak from dipstick might be fixed. The grounding arrangements in these tail lights is epically rubbish. I may wind up improving this myself to save me trouble in the long run. Handling is better than I expected. I reckon you could actually chuck this car around quite a bit once you're used to it. On the same topic, the suspension and steering feels really tight. No knocks, clonks or obvious play in anything like that. Ride is pleasantly compliant, bit of a surprise given how light she is. One horrible noise which has turned up a couple of times is the guard touching one of the pulleys very lightly - mainly just as you come off the throttle. I will sort this using a small amount of violence shortly. I know what it is though and it sounds way worse than it actually is. 50mph looks to be doable without too much trouble. Occasional miss/backfire on part throttle needs an eye kept on it. 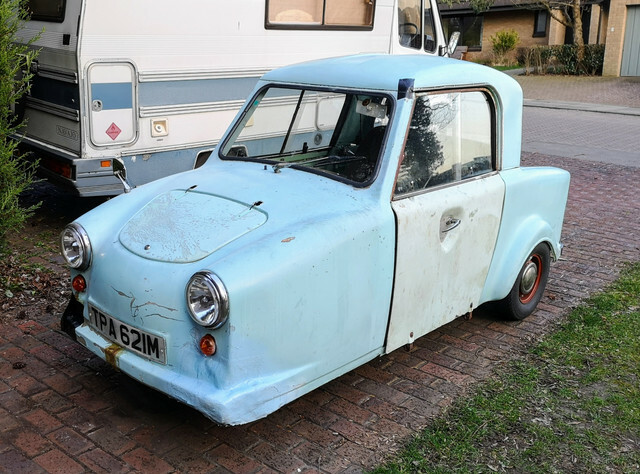 I needed to go to the nearest supermarket for one or two things this afternoon and very nearly took the Invacar...Sadly I chickend out. Maybe tomorrow. Definitely overall seems to be running better. The drive system seems to be behaving itself pretty much as I'd expect now, I think the biggest thing which initially was throwing me off is just the level of overall noise involved with the engine running at the speed it needs to for the clutch to engage. 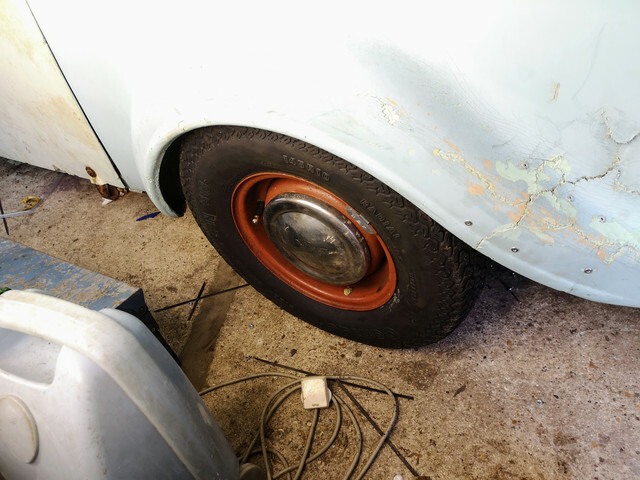 Was really glad to see that once up to speed that there weren't any unpleasant noises or vibration which would suggest duff wheel bearings or any boring problems like that needing attention. Today has been something of a "one step forward, a few hops sideways, and one backward." We knew there were going to be some of them, that's the whole reason we're doing the VERY local shakedown runs. Which I'm sure are really annoying my neighbours by now. First up, I did managed to track down the Not-A-Go-Pro and do a test with that stuck to the rear window. 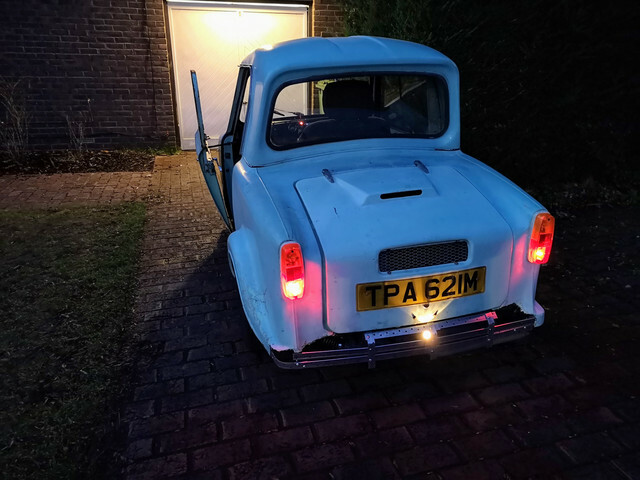 Annoyingly, while the video is better than I've managed from my phone - the microphone really didn't enjoy such close proximity to 493cc of thundering power behind the driver's seat in the Invacar, so I must apologise for the horrible audio distortion. This really does seem to make the ride seem a lot firmer than it feels in person, but better captures the degree of lean when cornering. At least around town you don't really notice the lack of a wheel up front. 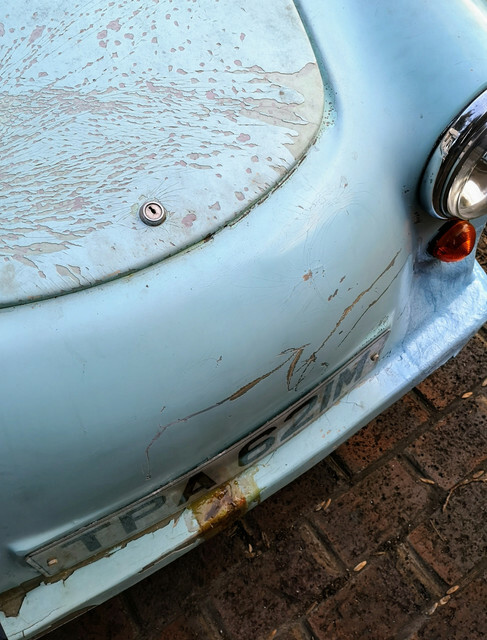 Until you come to park up at a kerb...the lack of a bump from the nearside front corner the first time I pulled over at the side of the road, *that* messed with my head. The free play in the brakes looks way worse in the video than it feels in person, I think the angle and the lens exagerrates it a bit. There's a good 2" of clearance between the point at which I can lock all three wheels and the bars hitting my knees. I managed to get the single carriageway down the side of our neighbourhood clear a couple of times today, so was able to do an emergency stop from 50mph, and am pleased to say that she can come to a stop more than adequately rapidly when needed. 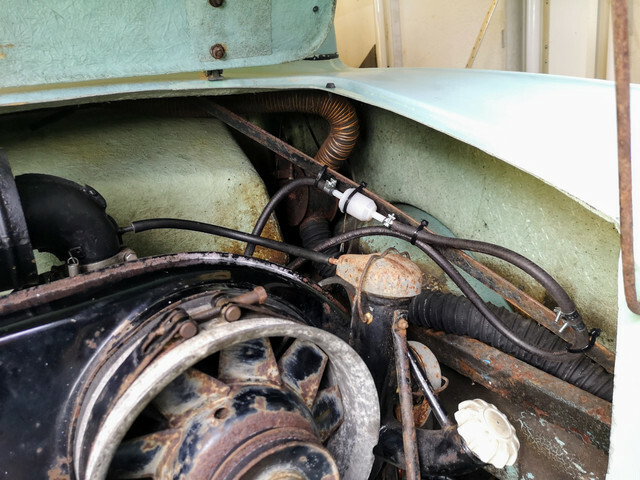 When I got back from that run, with an even five miles on the clock I decided to check the condition of the plugs just to give me an idea how the engine was running. 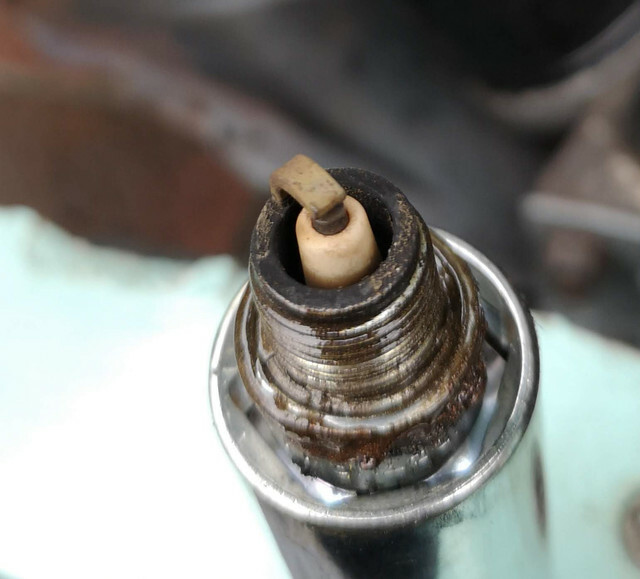 It's worth noting that the one in the offside cylinder has always had a history of flooding quite regularly on startup, and had always been sooty when the car had just been idling on the driveway. This is how it looked today. Here's the partner from the other cylinder. Not bad at all I reckon, though obviously it's hard to tell too much from so few miles. No obviously catastrophic oil contamination or anything like that at least. Today did unearth a few gremlins though. Fuelling. 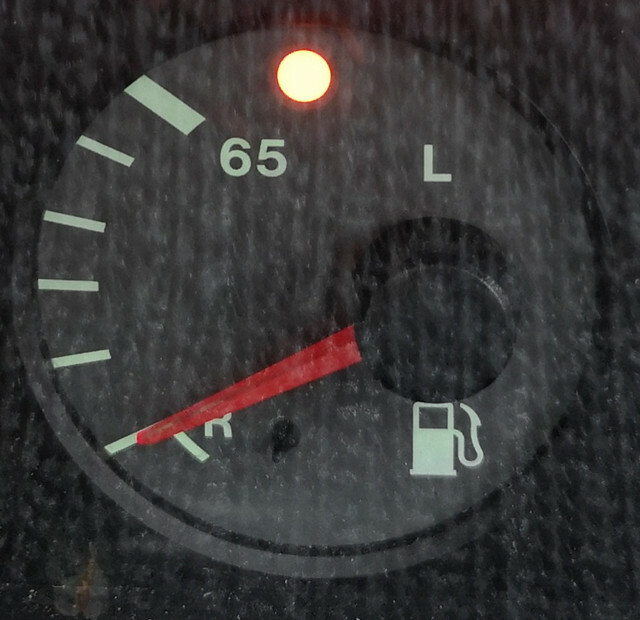 It seemed today that after I'd been going for roughly 30 minutes (including three higher speed runs), I started to experience what felt like severe fuel starvation. Thankfully I was able to limp back home. This definitely shows why I'm doing things this way though, for all it might seem needlessly over-cautious to some folks. I'm pretty sure that this problem is due to a problem with the fuel pump itself. 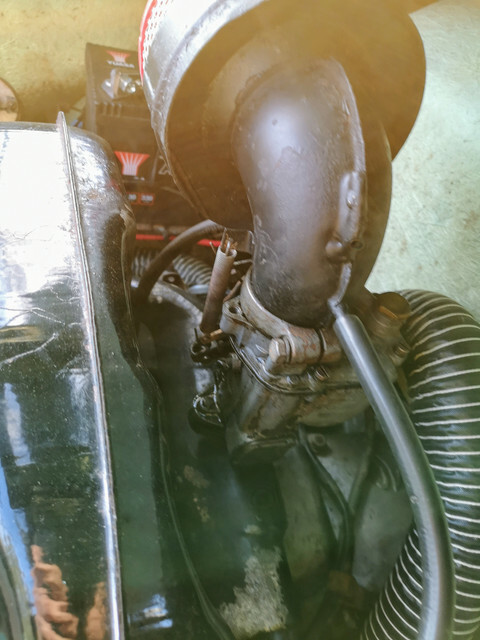 Looking at the fuel filter in the engine bay (between the fuel pump and the carb) you can see bubbles of air being pumped through along with the fuel. This is an absolute pain to try to catch visibly on camera. A problem on the suction side of the pump really is the only cause I can see for this. The line from the pump to the tank is a single piece of new hose, and attaches to the bottom of the (full) fuel tank. I'd have expected any holes in the line to have therefore made themselves known by leaking fuel out overnight as there should be a decent head of pressure there. Top of the fuel tank is roughly level with the top of the carb. Obvious question: Is there a vacuum issue due to venting problems? Nope...The cap is vented - and in fact the cap wasn't even on the tank when that video was snapped. A rebuild kit is avalable for the fuel pump...so I think that will be my next stop. 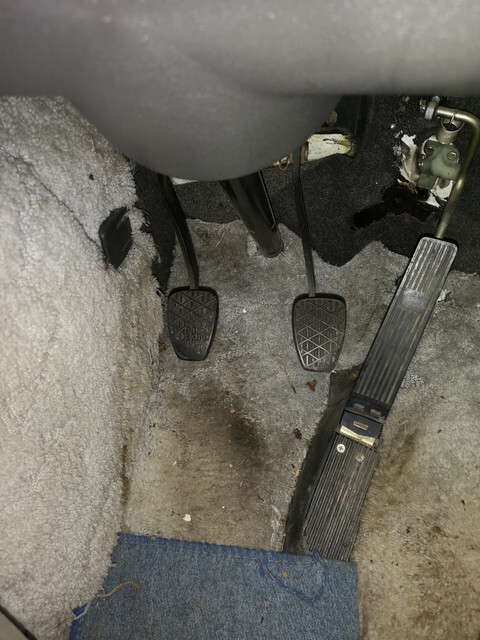 As I limped into the driveway on one-and-a-bit cylinders due to the fuel starvation issues, I applied the handbrake then suddenly found that my right hand couldn't find the gear lever for some reason. You may recall when I took this out of KP I was unable to extract the split pin from this linkage, so I'd put it together with a bolt and lock nut. Obviously this isn't up to dealing with the vibration etc, so I'll need to find a better solution. In the meantime I'll make up a new locknut and apply some threadlock to hopefully keep things together in the meantime. 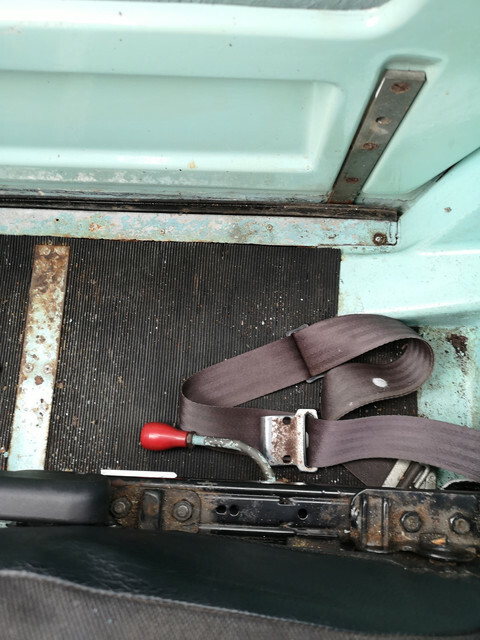 A long enough bolt to fit this position definitely needs to remain in the vehicle toolkit though! 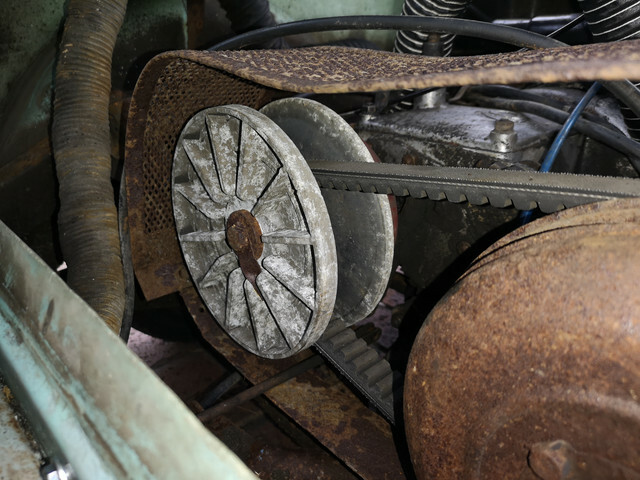 It was nice to see that the pulleys do seem to be cleaning themselves up quite nicely though simply through a bit of use, and that the belt tension seemed to have remained exactly as I left it when I adjusted it. While there's still some oxide left there visible, the surface itself feels far, far smoother than it used to. I did wonder if I should put more work into cleaning this lot up - but given that the drive system seems to be generally behaving itself I'm inclined to leave it alone for now. 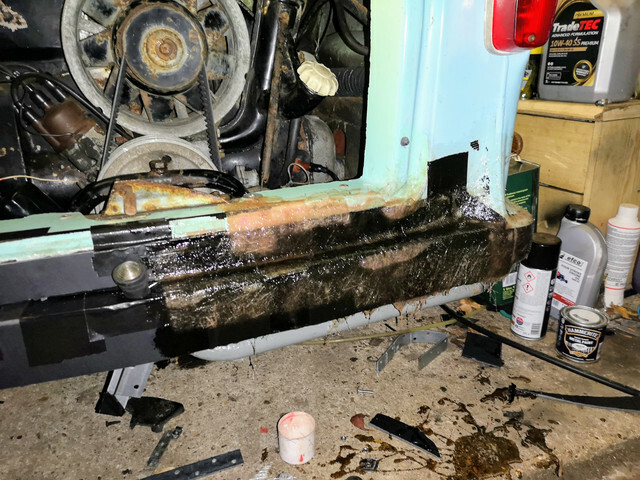 When reattaching the gear linkage it was hard to miss the fact that there was quite an obvious leak of gearbox oil from the top cover. 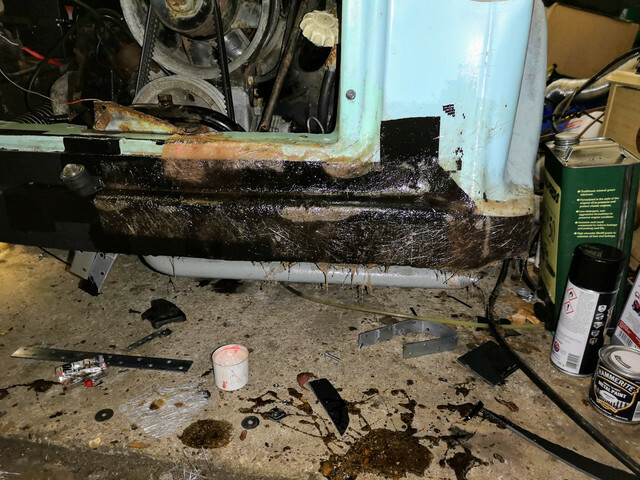 This wasn't a huge surprise to me given that the box was found essentially caked in a 1/2" thick crust of gearbox oil mixed with mud - what was a surprise what that all four of the nuts were barely finger tight...Let's hope that having nipped them up has sorted that. Failing that I don't think the cover holds anything in, so shouldn't be too hard to make up a new paper gasket if necessary. Before I went out today though I set about trying to do something to make her look a bit less like a set piece from some post apocalyptic disaster movie, this basically meant trying to shift some of the moss and grime. Attacking the doors with a stiff scrubbing brush and caravan & motorhome cleaner did a pretty decent job. There is still some discolouration which I'll need to hit with some cutting paste, but at least it looks *slightly* less like it's just been dragged out of a field now. I think thinks will probably need to take a back seat for a few days until I can get the parts for the fuel pump in. Sadly I don't have a suitable alternative pump, electric or otherwise, laying around or I'd test by substitution first. Obviously I can't really keep driving with a known fuelling issue. 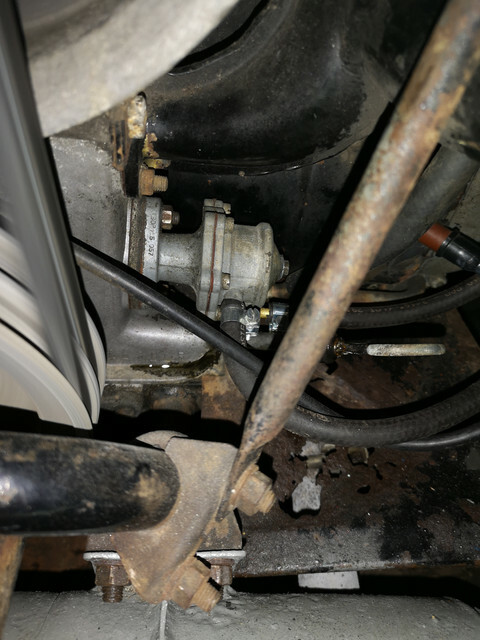 What I might do is hook up the fuel injection pump I've got laying around drawing from the carb end and dumping back to tank - the flow level that should get going might allow me to use my eyes and ears to track down where the leak actually is as I'll probably be able to hear it hissing. Will take the opportunity to readjust the brakes again - I have my suspicions that the front adjuster isn't doing its job, so may well swap it for a known good spare and see if that helps. As I've said before, the brakes feel really good. Nice firm control and good bite, just a lot of dead travel before you get to the point that the control does anything. Would have been nice to get a clean bill of health and just start driving places (as I'm getting quite comfortable with the actual act of piloting her now), but realistically we knew there were going to be things that would turn up and need sorting didn't we. £83 later...we were able to run those few errands. Readjust the brakes. I knew there was too much free play in the system, and checking showed that things did need a tweak. On the front in particular quite a lot of slack was taken up. 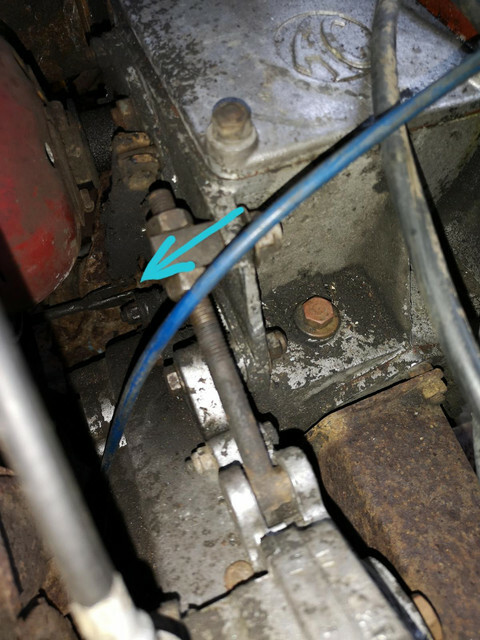 There is quite a bit of play in the actual pushrod that acts on the master cylinder. 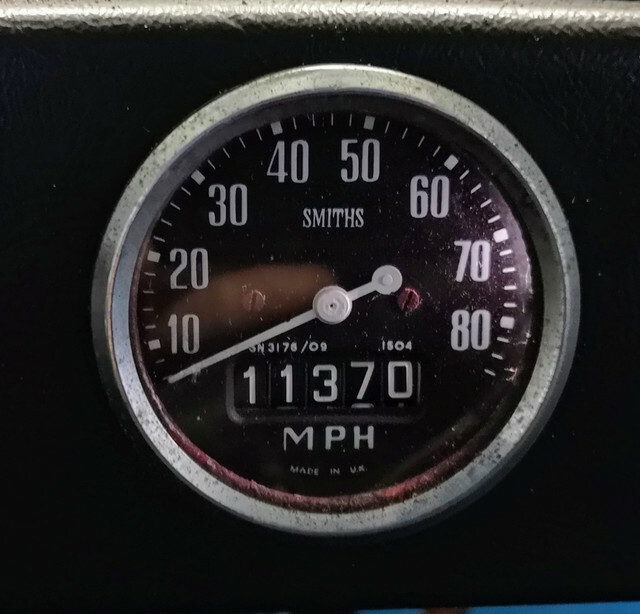 This is quite a critical adjustment...and I think I may need to change it...but I'm trying to see if there is in fact a way to do that (without the factory tool) without removing the master cylinder from the car. 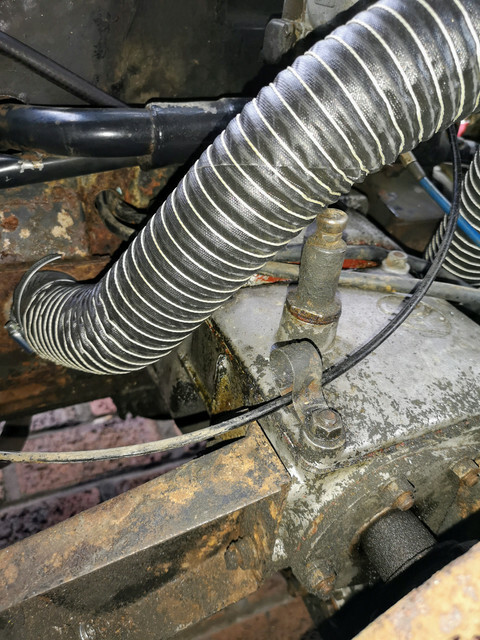 As I don't want to have to disturb and bleed the entire system yet again until I get the new rear flexible hoses made up and fitted. I seem to have spent as much on brake fluid as petrol lately between this thing and the van. Fuel system check. Given the issues I've had with the fuel system lately I wanted to go over it with a magnifying glass. I couldn't see anything amiss, but reterminated things at the tank end anyway, access was quite awkward last time due to the way the car was parked, so I know it's all lined up nicely now. Fuel gauge. As mentioned before, the sender I'd fitted was for the later Curtis/Veglia gauge, so have no reading on the old Smith's moving iron gauge. With my meter I was pretty quickly able to figure out which wires were what, and made up a jumper for the ground connection (through the case on the old one, which is isolated on the new one). Now I knew in theory it should work...only three wires involved and electronics is an already I'm usually at home, but would theory work in practice? Yep! That's exactly how much fuel is in the tank. This gauge is damped, so rocking the car only resulted in a tiny amount of gauge wiggling, but it definitely did move. I'll have to wait to see how accurate the tracking is as the tank is used. 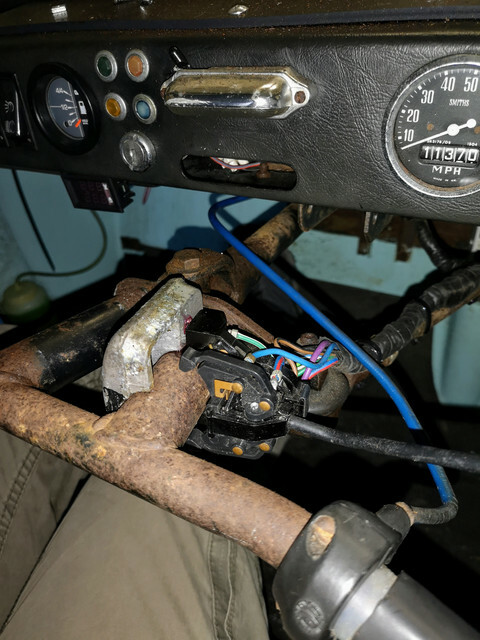 There's no wire in the original vehicle loom for the warning light, so I'll need to route a new conductor for that at some point. That isn't a priority though at the moment. 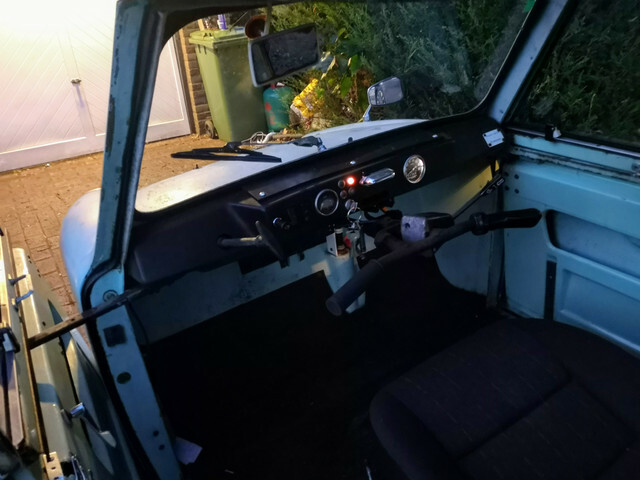 If I'm smart, I'll ignore that until I get around to pulling the dash to properly repair a couple of ancient wiring bodges back there and to add some mommon sense stuff like relays. 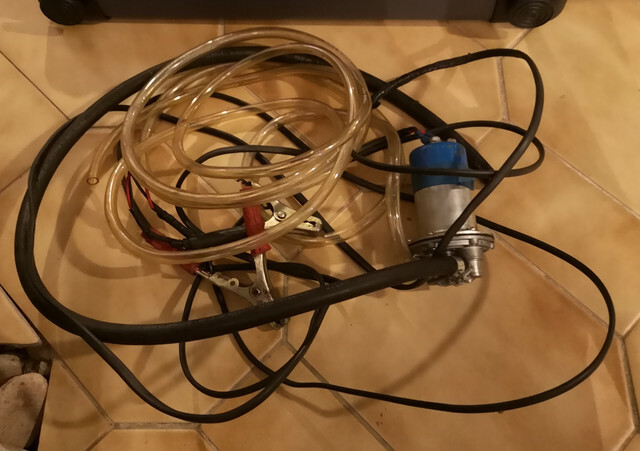 A friend has found an electric fuel pump I can borrow to either prove or disprove mine as the cause of my current fuelling gremlin too, which will be helpful. Given the rebuild kit for the current pump is £60 or so, I'd rather know before shelling out on it. At that sort of price I'm tempted to actually go with an electric pump anyway. Main reason being safety. If I do away with the mechanical pump I can keep the fuel lines all well clear of everything hot. That's currently impossible as the pump is essentially on top of the offside exhaust downpipe. I can see that causing fuel evaporation issues down the line too given how much more prone to that modern fuels seem to be. Target for this week? Get it to Newport Pagnell. Not least because I want to see the look on the face of my usual garage's staff when they see it! Thanks to the generousity of the gent behind Hub Nut I received a couple of items which are functionally unimportant but psychologically important shiny bits for TP today which I've now got fitted. Kind of hilarious worrying about shiny thing like this given the overall cosmetic disaster that the car is, but it makes me happy. Worked out quite well actually as I had a bunch of 12" wheel trims but am running 10" wheels, and he had a set of 10" ones but is running 12" wheels, so we did a swap. To that end, have just collected this from a local enthusiast to do some experimentation with tomorrow. Having the electric fuel pump in hand meant that I could start doing a bit of investigative work on TP's fuel system. 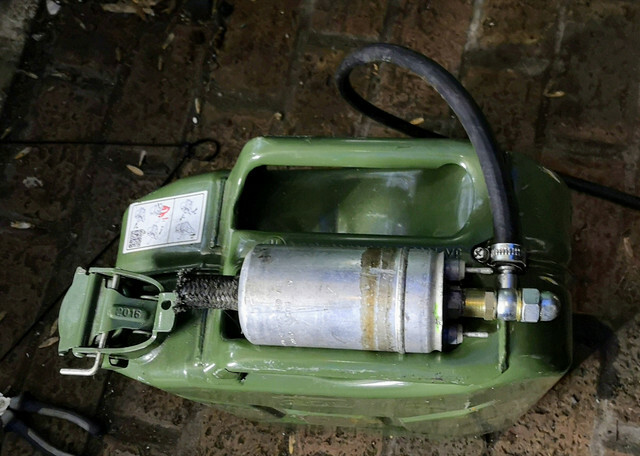 Step one though was to test the pump and to run a bit of clean fuel through it first, as I've no idea when it was last used nor what it last pumped. Not too much gunk came out really which was good to see. Attaching it to the car however did pose a bit of a problem. Connecting it directly in place of the original fuel pump was going to be a bit tricky on account of the hose connections on the electric pump being 5/16" rather than 3/16" like on the original. However the tank outlet is 5/16" and I have a reducer up front changing it down within a couple of inches of the tank. So it makes sense to just plumb it in up front - which is where I've generally seen electric pumps installed anyway. Can plumb the existing tank outlet to the pump, then the outlet onto the existing reducer. Annoyingly I don't have quite enough 5/16" hose to sensibly position the pump, so I'll need to go and get some tomorrow. I basically want to hang it from the top tank retaining strap in the front compartment - currently it's cable-tied to the nearest chassis rail. In the engine bay this left me with a slight quandry as well - as I needed to join the two bits of hose that were the pump was bypassed - however I didn't have a joiner specifically that size anywh...Wait...I think I know exactly what will do nicely. 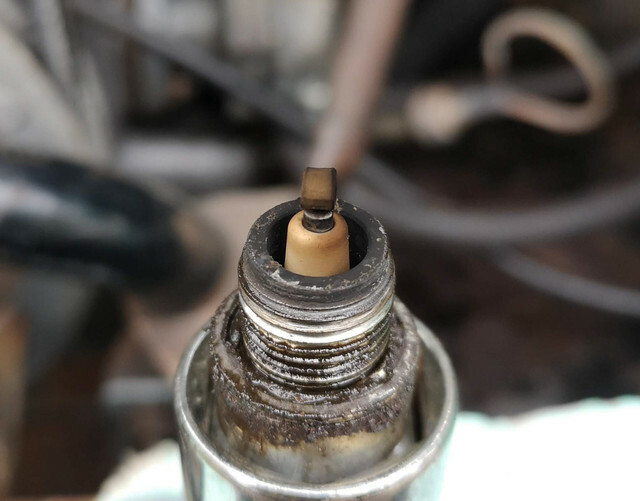 Going back about a year, one of the things I remembered happening when I was starting to contemplate the fuel injection conversion on the Lada was that the fuel return hose connection barb pulled out of the carb body when I attempted to disconnect the hose from it. The bit of my brain centred around improvisation figured that this would probably make a perfectly good hose joiner if I could find it. 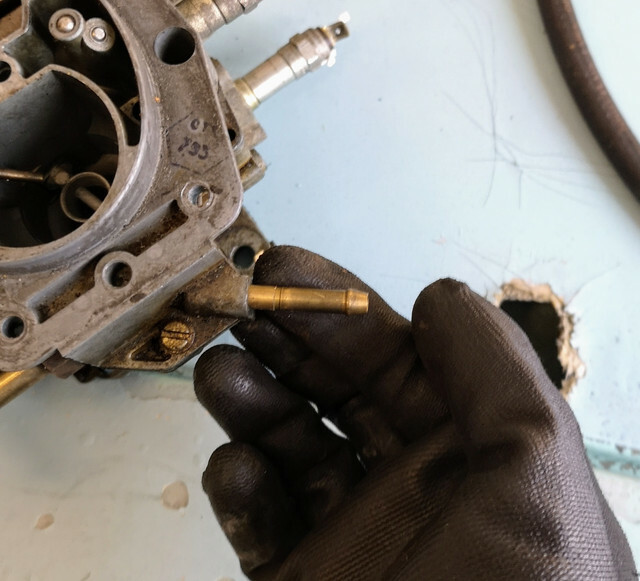 Thankfully this didn't prove difficult as I'd stuffed it back into the carb before dumping that in the box of "leftovers" from the injection conversion. This indeed did the job nicely, and allowed me to tether everything to one of the support struts in the engine bay. Obviously I'll do some proper hose trimming and rerouting if I stick with an electric pump long-term, but this will do just fine for testing purposes. Initially running things up hasn't shown any evidence of air being drawn into the system with the engine having run for 30 minutes or so. 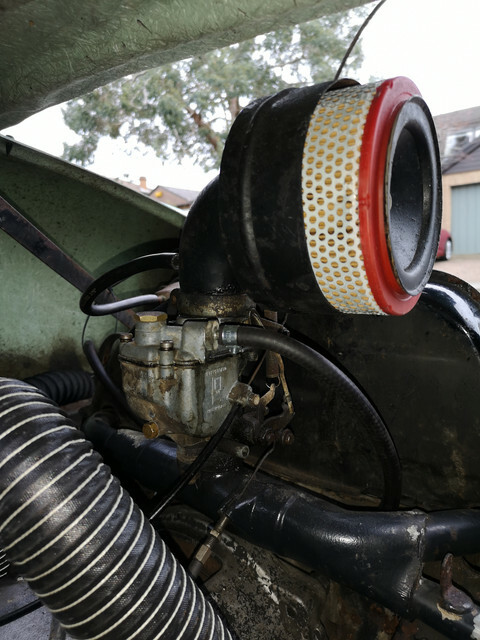 I have seen the occasional bubble *leaving* the fuel filter, but nothing on the inlet - so this must this is just a certain amount of fuel evaporation taking place within the filter housing itself. It is just the occasional one too, rather than a pretty steady stream we had before. I'll get some more hose tomorrow so I can secure the pump in a slightly less dodgy way, then will look to do a bit of a road test to see if there's any noticeable difference in behaviour. 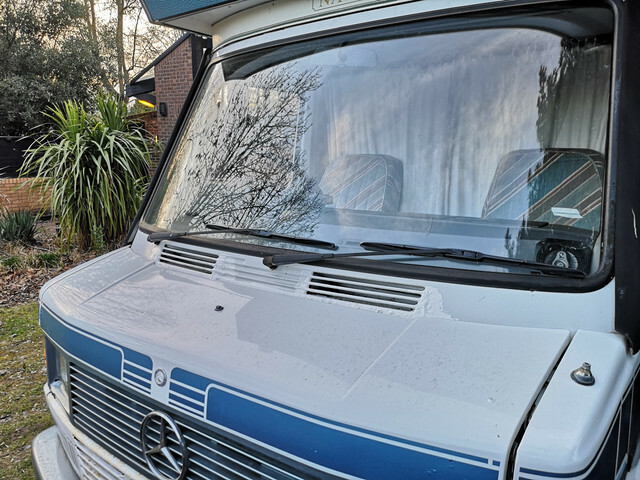 Also finally got around to throwing a bit of paint at the windscreen scuttle on the van, which I'd been meaning to do forever. It's not a permenant solution nor is it pretty, but the idea is that it will keep the critical combination of water and air from being able to get to the metal to continue to rust things once it's painted. Plus it looks a bit less dodgy at least! Spotted this today in Liverpool. Park anywhere lights, L plates and a dash-cam with rear view camera. I've only seen one of them in person once. 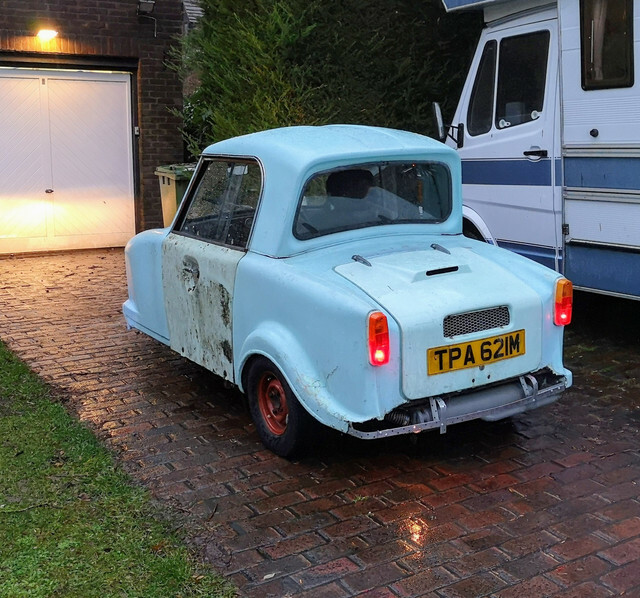 The immediate impression I got was that it made a Bedford Rascal (probably the most terrifying thing I've ever driven) look like a formula 1 car in the cornering and stability department! Following the seemingly successful test yesterday of the electric pump I wanted to move it to a slightly more sensible location. 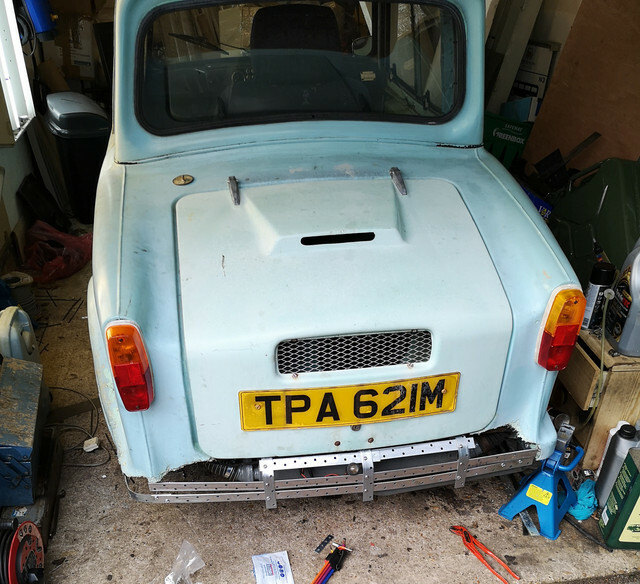 Putting anything like that under the car on an Invacar is pretty tricky as the chassis is quite shallow and there's no central tunnel or anything. So it will be getting attached to the upper fuel tank retaining strap. 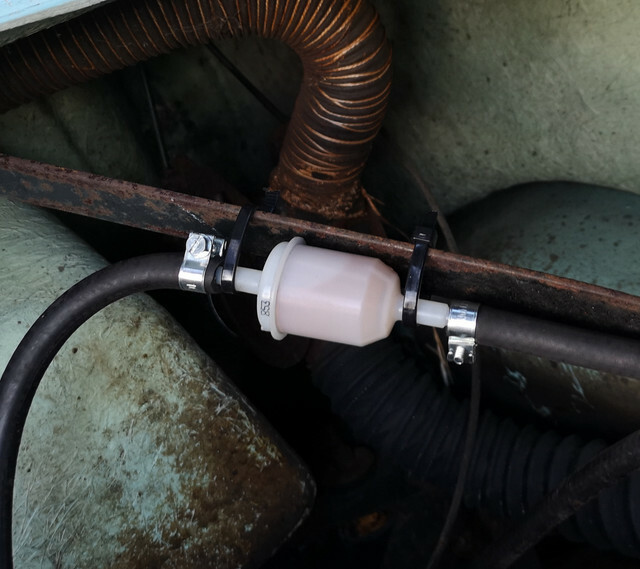 That will make it far easier to route the pipes without risking kinks as well and make wiring a power feed in less hassle. As the fuel tank outlet is at the bottom of the tank though I would need to empty it before I could remove the existing pipe from it. Previous tinkering had been done by clamping the hose, but I actually want to remove that hose now. I've a secret weapon for that though - an old and heavily abused fuel injection pump from my old Saab. 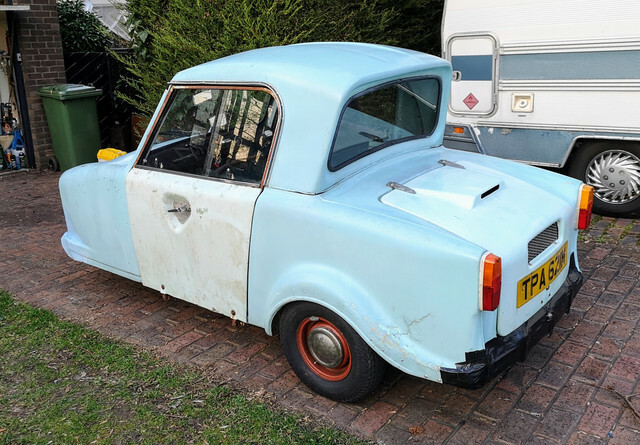 Tomorrow though I've some actual time set aside properly to get something done with the car so hopefully will get back on track and actually do a road test with the electric pump in place. Annoying lack of progress today! While it was a bit of a faff, I actually feel pretty good about today's efforts seeing the end result. Basically I wound up generally tidying up the area under the front service hatch as well as plumbing in the fuel pump. 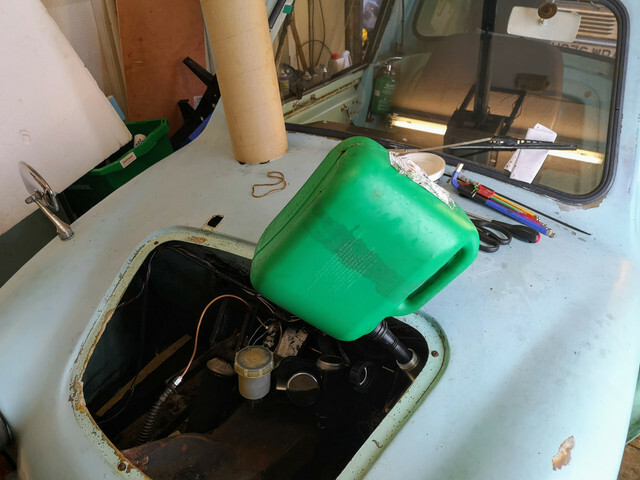 The cardboard under the fuel tank strap is a temporary measure by the way, I've got some closed cell foam on the way which will be going in there - once it turns up. Yodel have managed to lose track of it somewhere...so goodness only knows when/if it will ever turn up. The fuel pump is fastened in the old ignition coil bracket from the Lada. Once I packed around the pump with some rubber to keep it quiet it was a perfect fit. 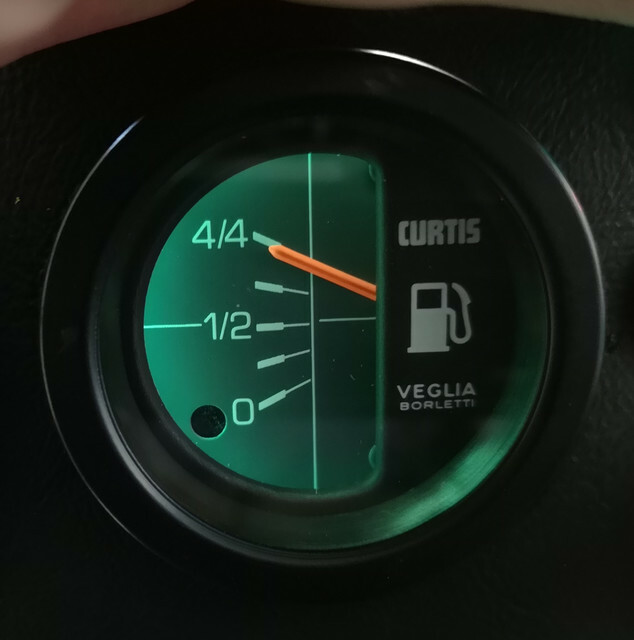 Speaking of the tank...something which has become apparent today is that the fuel gauge sender is in the tank upside down. D'oh! Oh well, easy enough to sort next time the tank is nearly empty. On the plus side, the gauge works fine...it's just reversed. Having spent several hours standing on my head of course I wanted to see if it had been worthwhile. So that meant going out for a spin round the block a few times. Still need to adjust the brakes further as there is still way too much free play, but the front is definitely doing more now and she is stopping in an absolutely straight line now. While I did not have a huge amount of time, I was able to buzz around for twenty minutes or so. That was well within the point that she had been starting to spit and carry on before, and was still running fine today. Given I was trying to cause high fuel demand, it was very much a "crack the throttle open up to 30, brake for junction, off again etc..." This has done good things for the drive system it seems, as the gearbox feels very much smoother now, and between 0-30 it definitely feels like it's doing what I'd expect a CVT to. Given I was being a bit more proactive in the "I want to make the car misbehave" department today it has really shown two things. First, she really is bloody quick off the mark...not even passable, properly nippy. Secondly...you really can throw her around the corners... I'm really staggered by the body control. It's hard to describe in words, but it really feels nimble. Reckon that a lot of their reputation must be down to lack of straight line stability due to lack of ballast rather than being actually tippy. After a couple of tens of minutes running usually the fuel filter would be visibly empty (I know that doesn't actually mean much), with bubbles feeding through. ...I really need to get some clear fuel filters, these opaque ones are annoying as it's so hard to see how clean or not the element is. Plenty of fuel visible and absolutely no bubbles...that being the important bit. I'll try to get out for a bit longer tomorrow afternoon. That's another five miles covered for those playing along at home. 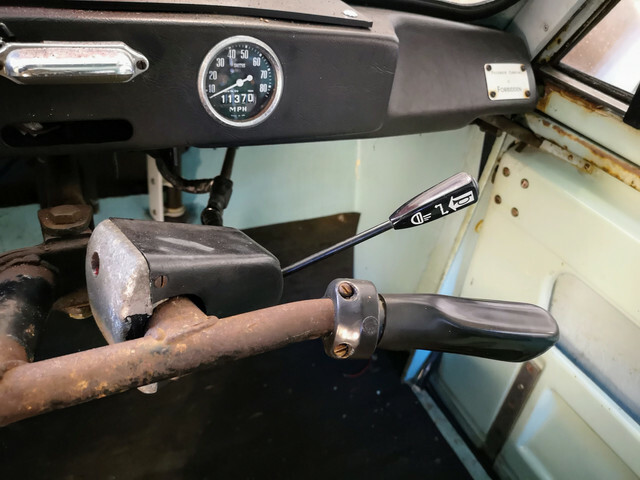 Would probably have been more actually as mechanically things were going just fine - however the indicator stalk decided to part company with the handlebars. ...This time sticking a load of threadlock on the screws. If it comes off again I'm resorting to the epoxy. I'm kind of amused that the first thing to actually fall off is something that had nothing to do with my improvisation, but is a Lucas parts bin item fastened to the car as the designer intended! I'd hoped to give the brake adjustment another poke today again but ran out of time. Things are definitely settling in in that department now as she rolls so much easier than this time last week, so expecting to need to fiddle around with that for a while until the shoes are all fully bedded in. I think all being well tomorrow might be the first time we actually go *to* somewhere all being well. Probably Halfords...about 3/4 of a mile away. Does involve a bit of 60mph road though, let's see if 50mph happens again. 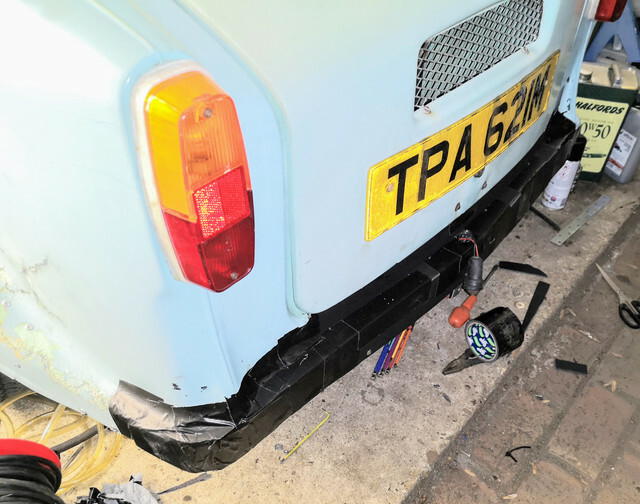 I've got some more foamed PVC board on the way (once Yodel find it or actually admit they've lost it so a replacement order can be shipped) which will help me rebuild the rear valance in a slightly less dodgy looking way. Here's a bit of a general overview of how she's looking now. Amusingly, I got back from the last run out just as our local police foot patrol wandered round the corner. Gave me a good opportunity to deal with my first "What even *is* it?" question, and see if they had any issue with the current state. They both said they couldn't see anything which would have had them calling in the traffic guys. 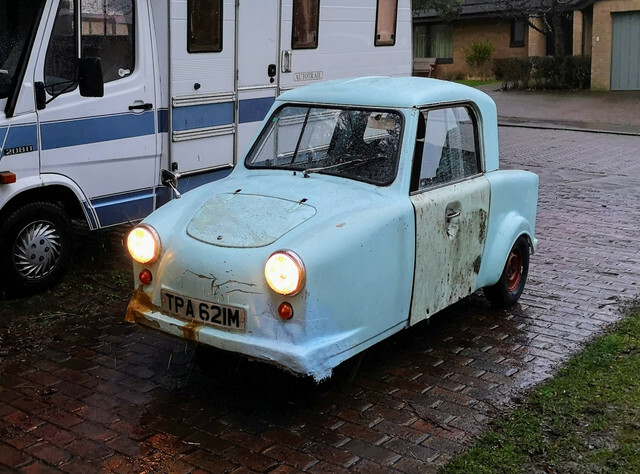 Lights all working, nothing hanging off, no pointy bits of bodywork and the brand new tyres are obviously a sign it's being looked after, and "There's a lot more dodgy handiwork in the Halfords car park!" That makes me feel a bit more comfortable doing my road testing. Hoping to get a proper walkround and intro video put together shortly, especially as I should be able to get to somewhere that's not right in front of my front door so can actually not have to keep things unlisted on YouTube. 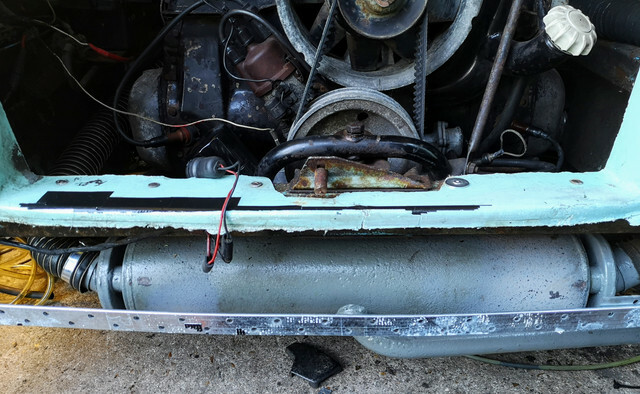 My initial plan for today was basically to go drive around in the Invacar for a bit and see if anything else fell off after finishing reassembling the indicator stalk. That bit was done in short order. 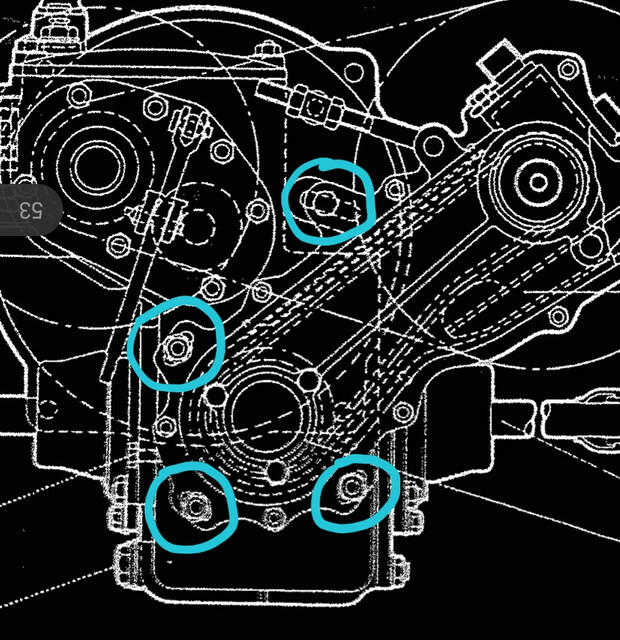 While I was doing that I rerouted the throttle cable a bit so that it was less in the way of the indicators. That proved to be a bit of a problem before, especially once the stalk got slightly loose and started wobbling around. I made an executive decision though and forced myself to do some actually useful work with regards to doing a bit more of a permenant repair to the largely missing bits of body. Off with multiple layers of duct tape and a large chunk of the metal frame which I deemed to be overkill. Interesting that it looks like the nearside of the exhaust has been running cooler, I'll make a point at doing an actual measurement of the cylinder head temperatures after a run to see if there's an obvious disparity between the two. I've just left the one band along the lower edge to help the resulting panel retain a decent degree of rigidity. The original panel would have had a lip moulded into it to help with that, but that's kinda hard to do by hand...so a bit of metal strapped to the back will do. I then got the foam core board out and set about fabricating a new rear bumper. I love this stuff...It's got way more strength to it than cardboard, doesn't go soggy if it gets wet, but you can easily cut it with a sharp knife and bend it by hand. Of course I ran out of daylight halfway through this, but this was the end result of the construction of the base framework. Trying to get photos of a semi-matt black surface with little ambient light was a bit tricky, but hopefully you can see that there is something like the shape of an actual lip below the engine cover and a bumper here now. While I was rapidly running out of time by this point I was determined to get at least some fibreglass laid down over this. I only had a couple of small bits left from the current pack of matting anyway, so figured I'd just use that and then call it a day. This is where we left things. Don't worry about the bits dangling down under it, that will get a nice clean edge cut in due course. I've realised quite a few errors in my workflow working with the fibreglass here, and that one of the key things to make your life easier (especially when working on vertical surfaces like this) is to work with small pieces of mat at a time, or you end up with finely atomised bits of glass fibre stuck to everything except the surface you're trying to stick it to. 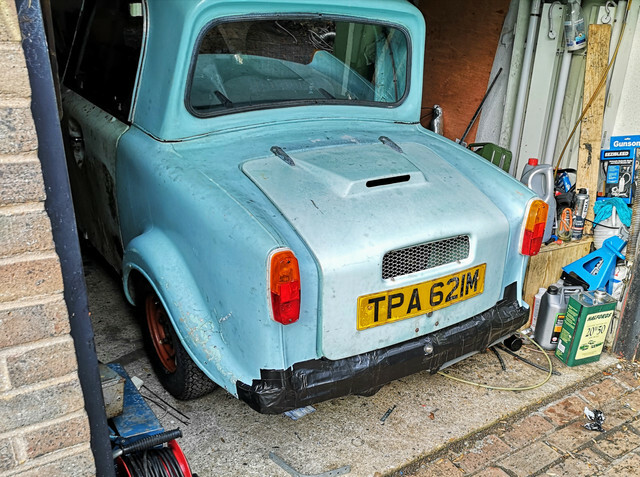 Once I've got a few layers on here though, a skim of filler and some paint on it I reckon we should be able to get a result which should be good enough. I'm not worried about a perfect factory finish here, "presentable from ten paces" will do just fine. 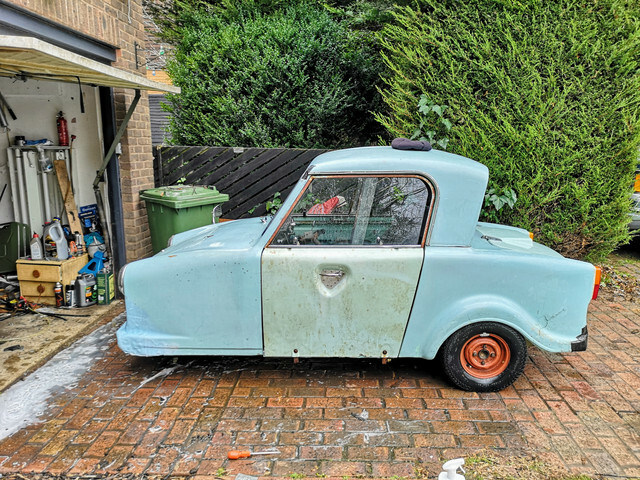 A slightly junior level looking bit of fibreglass fabrication is less likely to get me pulled over by a grumpy traffic cop I reckon than having half of the rear of the car made of duct tape.